In the long and complicated—indeed, often hotly contended—narrative of Miyamoto Musashi's life there are a number of important questions that remain tantalizingly elusive: What was his appearance? Where was he born? Who was his father? Who was his mother? Who were his children? Who were his benefactors? In what battles did he participate? With whom did he duel? What did he write? What are his paintings? Where did he stay? And where is his grave? 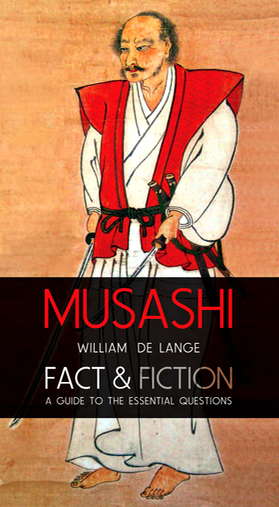 Up till recently, there were not many original sources to which the English reader could turn to answer these questions about Musashi’s life. Indeed, even in his Book of Five Rings Musashi hardly touches on any of these questions, limiting the outlines of his life to no more than a few paragraphs before launching into his exposition on his school of swordsmanship. With the translations of the complete range of classic Japanese sources on The Real Musashi, the English reader now has at his disposal a wholly new range of sources that nevertheless present a highly complex, at times even bewildering, array of alternative perspectives and narratives. This fully illustrated guide brings order in that chaos by carefully reconstructing the narrative of Musashi’s life. Through a clearly defined number of themes it finally address those hitherto unanswered questions on the basis of the original Japanese sources. Unless they are waylaid by firm historical fact, it gives as much credence as possible to these early accounts, not only because they are the only true sources we have, but to do justice to the great efforts of those early historians, many of whom dedicated the better part of their lives in a serious quest to uncover all they could about the man they, like so many after them, had come to admire.